“I first became intrigued by the elusive figure of Emmett Miller in 1974. I may have been vaguely aware of him before then, but it was I Love Dixie Blues, the album Merle Haggard dedicated in part to Miller’s music, that truly whetted my curiosity. In the bargain bin of a record store on Eighth Street in New York, I found a copy of an album whose stark and drab cover was ugly even by bootleg standards: title misspelled in plain black lettering on plain yellow stock. But this cover belied not only the beautiful disc of clear green vinyl that lay within, but more so the wonder of what that green vinyl held. Issued by the Old Masters label in 1969, Emmet Miller Acc. 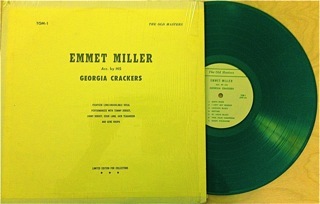 by his Georgia Crackers had been the first in a series of limited edition pressings for jazz collectors; the spelling of Miller’s name was obviously not as important as the fact that these recordings featured rare performances by Tommy and Jimmy Dorsey, Eddie Lang, and Gene Krupa….” – Nick Tosches, from his book on Emmett Miller: “Where Dead Voices Gather“. « Exciting News: Two of my compositions are on the new Boz Scaggs album!